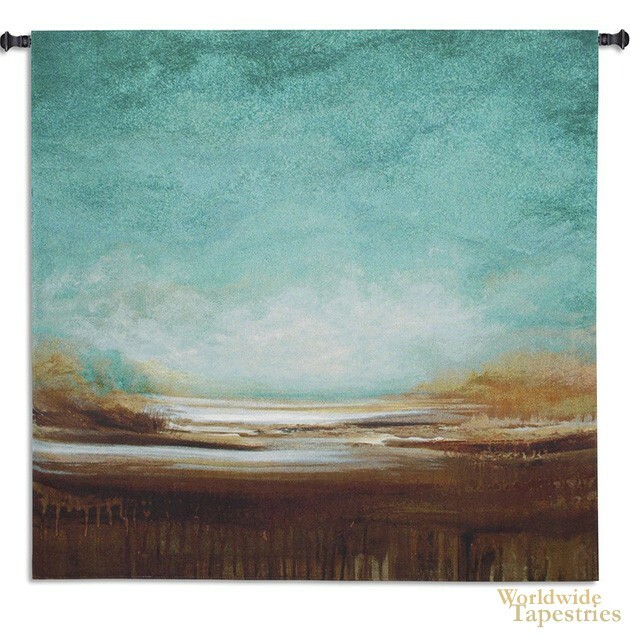 New Horizons tapestry shows a landscape scene of golds and aqua blues. Full of beautiful color, this scene shows a scene of brown landscape and marshes with a hint of a lake with an expansive cyan blue sky. The colors are gorgeous as they balance between the cooler hues of the blues with the warmer tones of the browns with a white gathering of clouds in between. New Horizons tapestry is backed with lining and tunnel for easy hanging. Note: tapestry rod and tassels, where pictured, are not included in the price. Dimensions: W 52" x H 51"